LOL I was wondering about the grey when I saw your tweets yesterday! Looks like I have to starve and wear rags again in order to keep up with all your new stamps! What a lovely pile of rubber, even if it is grey!! Get that Miss Jo over to sort your shed, we want to see inside!! Gotta get back to the day job now. Gosh you really do look like you have a few busy days ahead of you. another nosey parker here i'm afraid, guilty as charged! Looks like you have a lot on that desk to keep you busy. Happy WOYWW Day. I must admit I wouldn't want to be in your shoes trimming all that rubber! I guess you just have to keep in mind the satisfaction you'll feel at the final result! Hope that rubber mountain has dissolved into a little hill by the time you are reading this comment!! You've got me hyperventilating at all that new rubber and grey looks good! Loved reading your post and I'm intrigued to find out what's going... I'm hooked and you're good at it! I am so impressed with these. About two years ago, I took a tour of a company that makes their own stamps, then cuts them. It was so fascinating. Although they used mostly red rubber, they said the grey melted at a slightly different temperature, so they couldn't mix the two in the same oven. Fascinating, as was this snoop. Well it all looks very exciting to me! cant wait to see all the new stamps you have - I am going to Artisan so will hopefully see some there. wow! lots of stamps - all the best, I am a bit late, Fab Workspace, Happy WOYWW! Thank you for showing us your workspace. Wow looks like a lot of work to me, I think I'll leave you to it! Wow, look at all them stamps. Brill! Oh that sodding shed! Made me laugh out loud. You got new for old insurance right?!!!! Becasue I'm late, I've caught up - and NEED the christmas plates they look fab, and am thrilled and swooning for you over TH's visit - he clearly has no idea what two of you in the same room will be like. 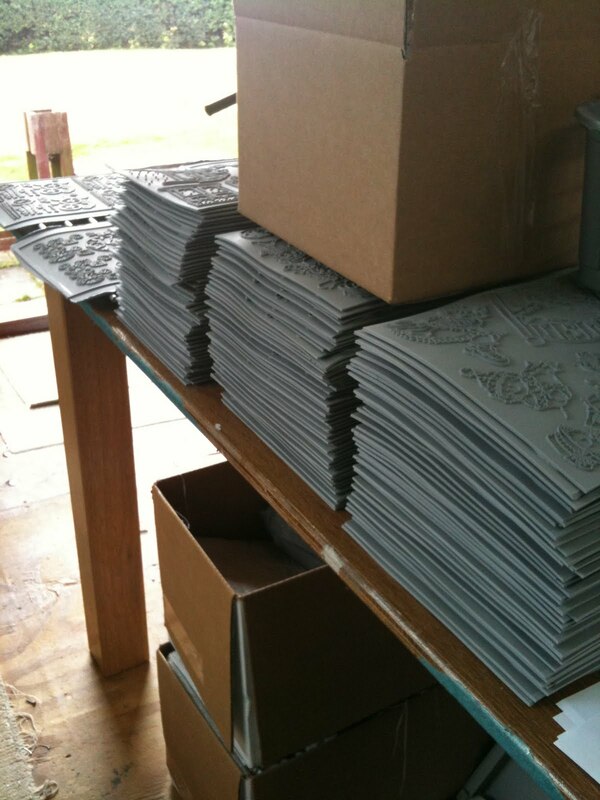 OHH, new stamps, freshly made...love that new rubber smell!